The lure of backcountry fishing isn’t simply the fish, but where the fish are — remote spots, accessible only by foot, canoe, or kayak, with nary a car or camper in sight. 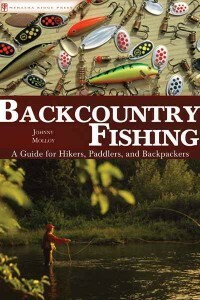 This essential guide has all the information backcountry anglers need to fully prepare for both day trips and longer excursions. It covers the necessary equipment, plus repair and maintenance; types of watercraft; campsites and cooking; safety; a list of fish and where to find them; and much more. 1. Food, where food is plentiful and easiest to catch — minnows, crayfish, insects, etc. Yep, food and shelter, just like us! While floating downstream on a river you should be constantly scanning the forthcoming water for holding spots, where a fish will be waiting, in search of a tasty morsel coming its way. Don’t worry so much about spooking the fish by boat as you would by foot, canoes and kayaks glide over the water and are much less obtrusive than a motorboat. When casting toward the shore, try to get as possible to the nexus of land and water. At the shore, fish will think that your offering may be a bug or something that has come from the land, such as a grasshopper, as well as potentially being something that lives in the water such, as a minnow. Try to get a little bit of an arc while casting so the lure will plop down on the water, alerting the fish of potential food. However, don’t arc it so high that its landing will scare the fish away. Sometimes, low branches and such prevent the ideal presentation. Other times you may throw a little too far and hit land — go ahead and pop your lure back into the water and continue your retrieve. Before casting, look for underwater obstructions, such as rocks or fallen trees. You will want to throw your lure to avoid these obstructions, but you want to cast your lure near the obstructions to take advantage of their fish holding potential. When casting as the boat is floating downstream, you must calculate the speed at which to retrieve the lure with the speed at which the boat is floating downstream, while simultaneously factoring in these water structures. Do not cast somewhere that will force a retrieve through fallen trees, or over exposed rocks. You will likely get hung and if you catch a fish you won’t be able to get it back to the boat. An ideal cast would plop the lure down within 1 foot of the shoreline, in front of where you think a fish might be, not on top of its head. A fish will strike something presented in front of it before it will atop it. If a fish doesn’t strike immediately, begin retrieving your lure on either side of the obstruction, whether it be a rock or log. Each side of the obstruction, whether upstream or downstream has its own advantages. When a lure that is being retrieved on the upstream side of an obstruction makes the curve to get around the end of the obstruction this is where a fish from behind the obstruction will strike, making an ambush. If you are retrieving your offering on the downstream side of the obstruction the fish will be more likely to see your lure and can also strike then. Be very careful when casting your lure onto the far side of a log — if the fish strikes you will have a hard time pulling it over the log with ultra light tackle normally used by backcountry anglers. Other times you will want to stop the boat entirely to fish. This is often done at a rapid. Once safely through the rapid turn the boat and eddy out as soon as you can find some still water. Then cast into the rapid, or other still water areas adjacent to the moving water. If you are catching fish and having a lot of action be patient and work the area thoroughly. It may be the highlight of your day. A good cast doesn’t have to be long to be a good cast. Whether you are in an eddy or moving, look for fish holding areas close to the boat and don’t be dissuaded from tossing as close as 5 feet away for a fish. Remember that placement of your boat to get yourself in the right position is as important as placing your lure in the right spot. The stern paddler should always be thinking about keeping the boat the proper distance from the shoreline and also looking downstream for potential hazards as well as potential fishing spots. Fishing on foot is an entirely different story. You always want to fish upstream on moving water. This way you are coming up from behind the fish, therefore all fishing techniques assume wading upstream. The general wade fishing technique can be broken down into three steps: approach, position, and presentation. When wade fishing you are stalking fish, just as the fish you are stalking are stalking their prey. Wear clothes that blend with the environment. Try to be as quiet as possible when working upriver. Always look ahead to see where you think the fish might be, then work your way upstream in order to not give away your presence. When in the water move slowly, making the least amount of turbulence. Try to stay on the edge of pools, so your reverberations will not reach the fish. Do not stare into where you think the fish might be. I fully believe that creatures can sense one another’s presence. And your presence can be given away by focusing too hard on where the fish is. Instead, size up the pool then appreciate the surrounding scenery until you are ready to make your cast. Here are some other approach thoughts: stay low — the higher you are the more likely a fish can look up to see you; avoid disturbing overhanging tree limbs and brush — the movement of this vegetation will put fish on alert; stay behind the fish — if you walk to the head of a pool then fish downstream then fish will be alerted to your presence. Once you have made your way to a good fishing hole, look for the best spot to drop your lure, then find the best position to make the cast. Does your chosen position have good footing? This is important because when you hook a fish you don’t want to slip and fall. Are there obstructions in the way such as limbs overhead or beside the stream? Can you make multiple casts into multiple potential holding spots in the hole from the position? Can you land a fish from your spot? Can you get your chosen spot without alerting the fish? All else being equal you want a relatively shallow spot adjacent to a gravel bar or dry land of some sort, a place without any nearby vegetation obstructions and a place where you can maneuver around in case you hook a big one. Do not fish from atop a high rock — you can’t get a good cast in the water and the fish will see you as well. A good approach to a good position should be followed by good lure presentation. Look over the fishing hole and make your first cast your best one to the best spot – the money cast. The biggest fish will be occupying the best spots in the pool per the pecking order of fish size. After your best first cast you can then try to cover all the other potential areas. By the way, if you think a fish is in a certain spot and it didn’t hit on the first cast , try again, but most strikes will occur on the first cast. When casting remember that fish will be holding on the edges of moving water or in deeper holes looking toward the moving water for a tasty morsel to float by. Therefore you will want to cast your lure into the moving water then run it by the places where fish may be holding, such as the downstream side of a rock, amid a fallen tree, or the base of a deep pool. For warm water species you can cast directly into the still waters with more success. In general, while retrieving a lure I will reel slightly faster than the flow of the current. However, you may vary the speed your reel within one cast, reeling slow in a slower section then as your lure crosses a faster section speeding up your reel. If the fish aren’t biting, vary your retrieve, alternating fast and slow to make the lure rise toward the surface, then dip down back toward the bottom, in jig fashion. You may want to work some lures slowly, or in a herky-jerky fashion, to replicate a wounded critter, which means easy pickings for game fish! And if you see a fish following it speed up! This is the natural reaction of prey to a predator and if you slow down, waiting for the fish to bite it will sense something is wrong and give up the chase. Fishing is a numbers game. The more casts you make the larger number of fish you will catch. You can definitely catch fish with the less than ideal catch. Be active to maximize results. Fishing is also a mind game. Believe you are going to catch fish, believe in your techniques, expect to catch fish. Be confident. Those who expect to catch fish catch more fish than those who don’t.